Faith is a little bit different, but she still likes to do all the fun things tht her friends like to do. Come and meet them all and you’ll see what we mean! 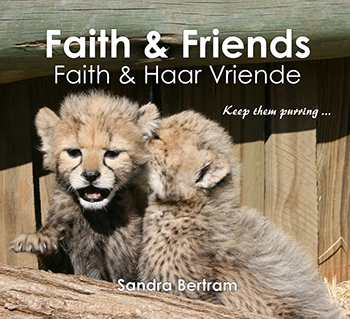 This unique children’s book is written by Dr Sandra Bertram, about real-life cheetah, Faith, whom Dr Bertram met while working at Cheetah Experience. The prose is both in English and Afrikaans, and there’s lots of gorgeous colour pictures. All profits from Faith & Friend will contribute to the Cheetah Experience, a non-profit organisation devoted to caring for and preserving endangered species.